Almost as soon as the ball slammed to the court, Jacqueline St. Cin '19 started crying. 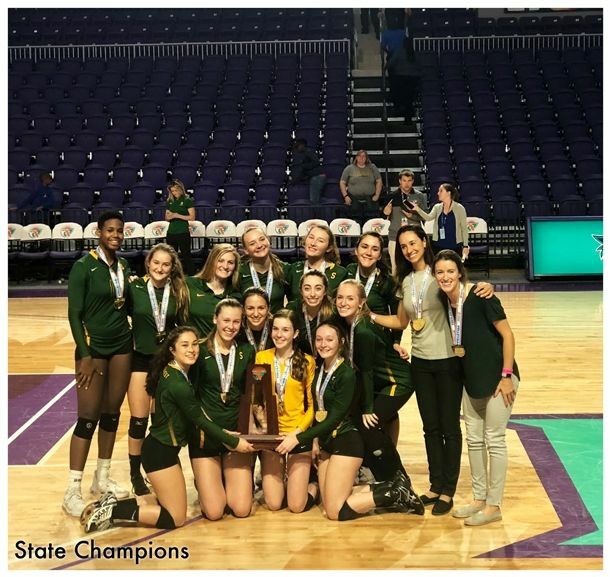 Her thunderous kill, one of 16 on the day, finished off a 25-23, 25-18, 25-22 Class 4A state final win over Palm Beach Gardens Benjamin on Saturday. Her Shorecrest teammates stormed the Suncoast Credit Union Arena floor. They screamed. They jumped. They hugged. They cried. The Chargers are state volleyball champions for the first time. "Probably cry all day," St. Cin said. Despite being district runners-up, Shorecrest (24-4) left no doubt that it is a deserving state champ. After losing to Calvary Christian in the regular season and the Class 4A, District 4 tournament final, the Chargers finally defeated the Warriors 3-1 in the region final. From there, they did not lose a set in their next two matches and lost only one set in the region playoffs. "I thought that if we could build our team to where they were strong enough to beat Calvary then we could beat anybody," first-year Shorecrest coach Raquel Ferreira said. "That is a very high level. So once we did that I knew that we could do this if we played well, obviously." Shorecrest played well enough in the final. The first set was highly contested. Neither team could build more than a three-point lead and there were 12 ties. Benjamin (22-5) looked like it might take control after taking a 17-15 lead on a Shorecrest error. But the Chargers came right back on a St. Cin kill and a net violation to tie it at 18. At 23-all, Shorecrest put it away. Chaise Campbell '20 put away one of her 11 kills and a net violation ended the set. "Winning that first set gave us some mojo," senior setter Taylor Waldmann '19 said. "We had that one in our back pocket. After that, we were like, 'Okay, we can do this. Now it's time to have fun and enjoy every single moment.' "
Shorecrest was certainly enjoying its 16-10 lead in the second set, but the Buccaneers made them nervous after getting five straight points. But the Chargers got six of the next seven points for a much more comfortable 22-16 lead. From there, Shorecrest ended it with a St. Cin kill and a Benjamin error. With a 2-0 lead, the Chargers played with confidence in the third set. They rattled off six straight points to take an early 8-4 lead. It got as close as 12-10, but the Chargers kept at it thanks to the net play of Campbell, St. Cin and Jacqueline Perry '19 (13 kills). Sophomore defensive specialist Julia Craig '21 was also all over the floor with 20 digs. Benjamin had some hope when it pulled within 24-22, then St. Cin dashed those hopes. "Honestly, that shocked me," St. Cin said of her final kill. "I'm always shocked when I do stuff like that. But there was a lot of adrenaline. I was just so happy." Campbell admitted there were some nerves throughout the match, but her teammates weren't going to let them get in the way. "We kept pushing, we didn't let up our focus at all," Campbell said. "We've been working on taking deep breaths and not letting the other team get ahead. Just get the side out." As she clutched the state championship trophy, Ferreira summed up the feeling of earning a state championship. "It's really, really cool," she said.